A parent's guide to modern dance for kids | Kwaddle | Enrichment For Kids. Better For Parents. Modern dance is great for improving the well-being of your child. It allows your child to be expressive in his or her motions and gives them a chance to experience different music and meet new friends. It's a great form of exercise as it boosts a child’s lung capacity and improves muscle and flexibility. There are many different types of dances for kids. Your kids can try everything from ballet to creative movement to find what sticks with them while also giving them an enjoyable experience. What Is The Style of Modern Dance? Modern Dance is constantly changing and molds to the personality of the person dancing. It tends to be dramatic, touching on human emotion. Modern dance can be experimental, not always having themes or a story, which makes it seem open-ended, giving the dancer a chance to create his or her own expression. Modern dance is inspired and created by mixes of other dance forms and is known to reflect certain events and feelings. An example of a modern dance lesson would be to make a movement structure using various colors of a rainbow and creating a way to depict its different colors. Modern dance is now categorized through expressions of the body, harsh body movements and emotional dance experience. It’s ideal to be surrounded by others in a modern dance lesson as it would teach your child to learn to interpret on their own and have a deeper understanding of their peers’ views and ideas. What Are The 5 Most Common Dances Kids Learn First? Ballet dance is a modern dance technique in which kids focus on grace, balance, and strength. It helps your child gain the dance fundamentals to dancing and will open up the opportunity to get into many other types of dancing as well. Kids will start to work on posture and body alignment while developing strong muscles and learning positions. A pre-ballet class is great for young children from the age of two, but when advancing to classical lines, it is ideal for your kid to be at the age of six and above. Although ballet has been custom for a long time, dancers can change the way they perform the classic dance style and add their own modern flair to it, making more personal and meaningful. This modern dance technique is less structured and less formal for kids. This type of dance focuses on expression and listening skills. Kids will be acquainted with all types of dance steps such as tap, ballet, and hip-hop in creative ways. Based on the dance classes or dance studio, parent involvement is a requirement to support and encourage the little ones. Creative movement lessons should though be taken are great if the child has a greater passion for dance and is already familiar with other forms of dance and is ready to explore something new. Tap is a great dance style for all ages, particularly the young ones. Tap dance involves artistic movement and sounds of the feet as well as expressive ways to let loose and have fun. Tap dance is an excellent dancing option for a beginner dancer as young as 2 years old. Tap is a strong foundation for kids that want to learn how to dance and is versatile in the sense that it can combine with other types of dances making a fusion dance. Jazz combines dance moves and techniques from different varieties of dance styles ranging from lyrical to contemporary and more. Although jazz dance isn’t seen as modern dance, the movements are expressive and imaginative. Leaps, turns, and high kicks are just a few of the moves that are involved in learning Jazz dance. In regards to kids, jazz dance is becoming more popular as it requires a slew of different motions, thus enhancing flexibility, joints, and muscle all while being enjoyable and relaxing. Furthermore, jazz dance is imaginative and allows a child to be creative with his or her movement and fosters self-expression. What Do Professional Modern Style Dancers Do? A professional modern style dancer has the desirable job of expressing work of art through the choreographed movement of their body. Professional modern dancers perform in complementary and featured roles in concerts, recitals, music videos, musical theater, movies, television, and any venue where entertainment is provided to live audience. Just like filmmakers who tell a story through crafted imagery, professional modern dancers provide a communicative and narrative emotion through their physical expression. Ho w Many Years Of Training Does It Take? Training to become a professional modern dancer will take between 8-10 years. Kids who start dance training at a very young age usually start with 1-2 ballet technique classes a week. As the kids get older from age 14 they are heavily involved in more classes a week which are made up of different dancing techniques, from jazz to tap, hip hop to creative movement and much more. To become a successful and professional dancer, a person must develop and improve their talent through many years of training, practice, and study about the expressive nature of arts. What Does It Take to be Successful in Dance? In learning and practicing the sequence of a dance, professional dancers will spend a considerable amount of time conditioning, themselves for the physical harshness of the job and strength training. A successful dancer should not only accel in dance but many other spectrums. 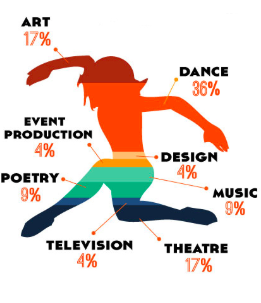 In the infographic, there are many different categories and the importance of them to a successful dancer. Dancers are not just performers or entertainers, but they are also extreme athletes. Dance training involves a lot of physical struggles, mental alertness, and making use of natural abilities. Dancers must improve their stamina, athleticism, work ethic, and mental acuity in order to become a professional dancer and survive in this competitive field.